This week, Giants owner John Mara slipped a very interesting tidbit into the public consciousness for the first time. Mara, who is on the league’s Competition Committee, noted that the league has had preliminary discussions about removing kickoffs entirely from the NFL. Such a move would eliminate one of football’s most dangerous plays in the hopes of keeping players healthier by reducing the league’s dangerous concussion rate. In the process, though, it would make the game less exciting and remove a competitive advantage for teams like the Bears and Jets. If the NFL does decide to remove kickoffs, they’ll naturally need to replace them with some sort of mechanism for changing possession and beginning each half. They’ll also need to address the resulting absence of onside kicks, which would make games with Tim Tebow far less interesting in the fourth quarter. That’s where we come in. We’ve done some brainstorming and come up with a number of new rules that the league could institute in place of the old kickoff laws. Of course, none of them are foolproof, so we’ve also come up with the arguments for and against each idea. Idea 1: Give the receiving team the ball on their own 20-yard line to start each possession. Advantages: The simplest logic: Pretend every kickoff is a touchback. No possibility of players getting injured on kickoffs if there aren’t any kickoffs. Disadvantages: Removes competitive advantage for teams that are effective at covering and returning kickoffs. No allowance for onside kicks. Basically eliminates any value provided by kickers, since field goal percentage from year to year is essentially random. Idea 2: The receiving team gets the ball on their own 20-yard line after touchdowns and on their own 30-yard line after field goals. Advantages: Gives teams an extra reason to be more aggressive in short yardage, creating more exciting fourth-and-short opportunities to offset the absence of exciting kickoff returns. Open to further modification, too: Maybe you give the opposing team the ball on the 35-yard line if it’s a successful field goal from inside the defense’s 5-yard line. Disadvantages: Some teams will get screwed by the scenario; if you’re down two against Eli Manning with 90 seconds left and have fourth-and-goal from the 2-yard line, you’re not going to want to give him the ball on your 30-yard line, but you have to kick. Also, all the disadvantages from Idea 1. Idea 3: The receiving team’s returner is handed the ball on his own goal line. His blockers must be positioned on the 20-yard line. The “kicking” team’s players are positioned on the opposition’s 40-yard line. Once the whistle blows, it’s a traditional kick return. Advantages: Everyone on the field will still be colliding, but because the kick-coverage team will have been running for 20 yards as opposed to 45, there won’t be anywhere near as much momentum in those collisions. That should produce fewer injuries. Teams will still be able to occasionally break a big return for a touchdown. It’s pretty clear that our ideas for changing the kickoff need to involve some sort of separate play for the onside kick, one that wouldn’t resemble a kickoff altogether. That eliminates the surprise onside kick from the game, but that’s a risk we’re going to have to take. Each of these three plays would be an option a team could choose in lieu of the standard kickoff we mentioned above, and you could build in some penalty if the team fails; maybe the team that successfully defends against the onside kick takes over at their own 40-yard line. Idea 1: The coffin-corner onside punt. The team hoping to recover an onside kick runs a punt play from their own 15-yard line. To successfully recover the onside kick and retain the ball, that team’s punter must successfully knock the ball out of bounds between the opposition’s 30- and 33-yard line, with his team taking over possession at that spot. A successful onside kick can occur through the air or on a bounce. 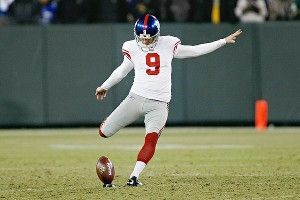 The punt occurs under automatic fair-catch rules; if the defending team gains possession of the punt, the play is dead. If a member of the opposing team (including the return man) touches the ball without gaining possession, it’s a fumble and a live ball. If the punt is blocked by the defense, they gain possession at the spot of recovery and can advance the ball for a touchdown. Advantages: This would be exciting. There won’t be anywhere near as many injuries, since teams won’t be able to hit the opposing return man unless there’s a fumble. Accurate punters would become superstars. Jeff Feagles might unretire and play until he’s 75 if this happens. Disadvantages: Is this too easy? It might be. The bigger problem, though, would be that referees would need to successfully ascertain whether a punt that could be pretty far up in the air went out of bounds inside a three-yard range, which is probably putting too much faith in referees. This rule might need to wait for microchipped footballs. Idea 2: Forget about the kicking play and add opportunities for the opposing team to score more points on the post-touchdown conversion. In addition to the traditional extra point and two-point conversion, teams would have the opportunity to produce four points after a touchdown (for a total of 10) by converting a 65-yard field goal. To prevent teams like Denver and Oakland from abusing the four-point play, teams that miss the 65-yarder would give the ball to the opposing team at midfield on the subsequent possession. Advantages: This makes incredible comebacks a little easier, since a 65-yard field goal is still probably going to be slightly easier than kicking an extra point, recovering a traditional expected onside kick, and then driving for a field goal. It would create additional strategic decisions based upon the threat of the four-point play, which makes football more fun. Teams would insist on carrying a big-legged kicker for this specific situation, which would make guys like David Buehler into valuable propositions. Disadvantages: We’ve gradually gotten further and further away from real football with these suggestions; this one is rapidly approaching the Rock-and-Jock Sports uncanny valley. It makes touchdowns seem less important; how can a 95-yard drive only be 50 percent more impressive than a lone field goal? Cowboys fans would also probably like us to note in the Disadvantages section that this would make guys like David Buehler into valuable propositions. Idea 3: You probably wondered what the three-point play would be, right? Well, that involves the offensive team successfully converting from the 5-yard line. That’s not tough, right? Well, consider that the defense gets to put 13 players on the field to stop the conversion. Advantages: The Giants would be able to run out their Super Bowl defense all the time! Disadvantages: OK, let’s end this before it gets really embarrassing.